As I was driving around my city, I passed by a local Jack in the Box. And for the first time, it had something that actually caught my eye. Don’t get me wrong, I love me a good burger from Jack in the Box. It’s actually one of my favorite fast food places to go. But today, I saw something that made me raise my eyebrows and scoff in skepticism. I found out that Jack in the Box is now selling Teriyaki Bowls. “Wow, dude. That’s old news,” you may be thinking. And you’re probably right. I haven’t watched TV in literal years, nor have I seen a proper advertisement thanks to all these wonderful adblockers. So seeing this giant poster of Jack’s new Teriyaki Bowls caught me off guard. 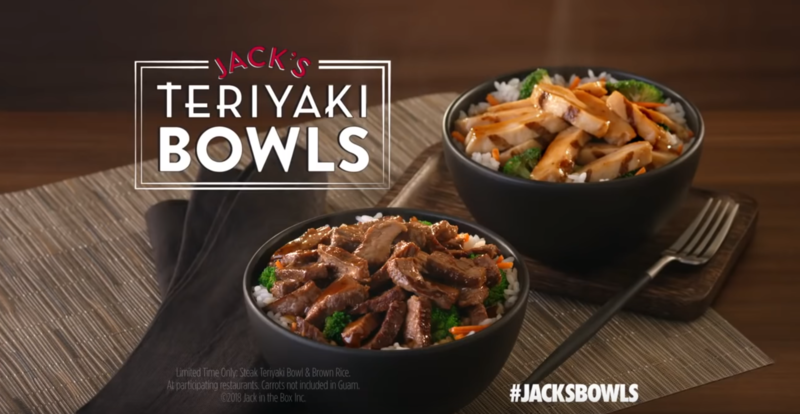 Now the inner angry Asian guy in me wanted so much to try these bowls, react in disgust, and write an angry review about how this was a cultural appropriation and a horrible one at that as well. It’s 2018 people. We’re supposed to get angry at everything, come on now. So I made a U-turn, waited in line at the drive-thru, and ordered both the chicken and steak teriyaki bowls. I got one as a combo to make sure I wasn’t missing out on the entire experience, and to further my skepticism, the drive-thru screen met my expectations flaring a line that read, “Combo – (1) egg roll”. “Wow Jack, you may have just lost a customer,” I thought as my anger felt a low burn. To further my disbelief, upon opening the bag, the teriyaki sauce that came on the side literally read “Teriyaki Sauce BLACK BELT in Flavor” (Picture for reference below). Like WTF Jack??? Are we not trying to move past this stereotype that Asians are more than just books and kung fu masters? That being said, I didn’t want to let a simple sauce deter me from actually trying the bowl; I wanted to be fair. And to be even less biased, I had a friend help me out in the taste test. Upon initial glance, the bowls actually didn’t look too bad. Visually, they could actually be compared to a teriyaki bowl from Yoshinoya or even a less desirable version of Flame Broiler. I have to admit… I was surprised. For one, the fact that it was coming from a fast food burger place made me feel as if it had no choice but to be bad. Two, it was another fast food place trying to emulate an Asian style of cooking. Three, it had a really bad attempt at making a tired old Asian joke. I wanted to hate it so bad. But… the meat was okay. The chicken was mostly juicy and although bland without the teriyaki sauce, was decent. The steak was also not half bad. Although I disliked the vegetables, my friend said she liked the broccoli and that the carrots were better than the chicken (she hated the chicken). Then I tried the eggroll. Oh man, did I want to hate this thing. But I gotta say, both my friend and I agreed that this eggroll was the best part of our meal. Although missing the typical crunch that’s associated with eggrolls, this thing is not lacking in flavor at all. I would actually come to Jack in the Box, order my burger and get this bad boy on the side to go. That being said, the worst part of this bowl is the RICE. Man, they overcooked the rice to the point where it was rice glue. So after all that, I guess I gotta say, aside from the terrible “Black Belt” advertisement, this teriyaki bowl wasn’t actually so bad. I give this teriyaki bowl a 3/5. As far as teriyaki bowls go, this is definitely not the worst one I’ve ever had. My friend gives it a 2/5 (she really didn’t like the chicken). So if you were curious at all about whether or not you wanted to try the teriyaki bowl, don’t bother. Just go to a place you normally go to – it’s not worth it here. Unless you want to try it out for hits and giggles. Without rice, 3/5. With rice, 1/5. Bad advertising. Okay bowl. Okay meat. Decent vegetables. Bad rice.